We can tell you how great we are but does that really amount to anything? Several of our satisfied clients were all too willing to submit Reviews for Lancaster Manufacturing’s great service. To our future clients, please read these reviews from our happy clients! We appreciate them taking the time to compose such compelling testimonies. Some of them have active websites, and if you feel inclined, check them out. Building your business from the ground up takes passion, dedication, and a lot of hard work. It’s important to have someone looking out for you to guide you through the process. For me, that person was Tony Carey, owner of We All Scream. 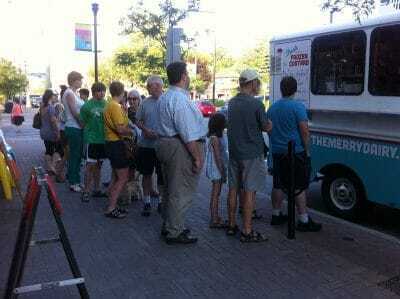 I found We All Scream while I was researching frozen custard machines online. After talking to Tony, I knew he was the right person for me. He was genuine, knowledgeable, and most importantly, willing to help me with every aspect of opening my business. Tony is customer centric. I can call or email him anytime, day or night. He’s always there and responds quickly. One of the areas he helped me the most with is finding equipment. In addition to finding me a great frozen custard machine, he helped me pick out most of the equipment I needed for my frozen custard shop. Buying used equipment helped me save on money, and Tony’s expertise helped me know I was getting great equipment. People always ask if you’d recommend someone to a friend. I can do better; I recommend Tony to myself. I plan on working with him again when I expand my business. Don’t just take my word for it. Get out there. Talk to other people. Compare and contrast service. Make sure to give We All Scream a chance. You’ll be happy you did. “The Merry Dairy Frozen Custard Truck opened up in spring 2012 and success the first season was very dependent on the purchase of a single barrel, used frozen custard machine being shipped all the way from Michigan to Ottawa, Canada. When I was starting my business there was plenty of risk involved. Operating a powerful frozen custard machine in a truck running off a generator was not commonplace, and I was purchasing and importing a used machine based on photos and telephone conversations. I also purchased a new dipping cabinet manufactured by We All Scream. Not only are the frozen custard machine and dipping cabinet excellent, the customer service that Tony Carey provided at We all Scream was superb. From my first exploratory phone call when I said “I’m looking for a frozen custard machine, preferably used” to getting started up, and then throughout the season when I had questions, Tony was always helpful. He spoke to service people here when I was installing the machine in the truck and always answered questions during the season with very little turnaround time. Once when I misplaced a part before a big festival he was ready to ship the part within hours so that I could have it in time. Growing up in my dad’s ice cream shop, I dreamed of one day opening my own business. In April of 2010, my childhood dream came true when I opened up Berens Frozen Custard outside of Atlanta. When my dad passed away a few years ago, I decided it was the right time to go into business. I went online and began researching companies selling frozen custard machines. I called and interviewed them all, talking to them about their machines and services. The decision to work with Tony Carey at We All Scream was simple; he clearly knew what he was talking about and was by far the most helpful. When I found Tony, I needed more than just a frozen custard machine to start my new business. He found a frozen custard store that was closing down, and helped me purchase everything from cash registers to dipping barrels. He even rebuilt their three-barrel frozen custard machine for my store. We All Scream was with me every step of the way, as I opened up my store. They helped with installation, Health Department Issues and even helped us to research financing options. Whenever I had a question they were always there with what I needed. They trained my employees to use the machines, teaching them how to make frozen custard, concrete mixers, and other items on the menu. Tony also helped me find vendors for the flavorings and mixes. I would recommend working with We All Scream to anyone thinking about opening up their own frozen custard shop or adding a frozen custard machine to an existing restaurant. Their machines are fast and reliable, but most of all their service is simply the best. Hi, My name is Dan Katchel, and I’m an ice cream-aholic. It was my love of ice cream that inspired me to open up Majistic Café, a full service restaurant and frozen custard shop, in Rock Hill, South Carolina (SC). My family business opened up two years ago in April, but it wasn’t without a few hiccups along the way. The first company I worked with was great at selling me equipment; beyond that they weren’t very helpful. They never answered my questions about how to find suppliers or how to figure out stock, but the biggest disappointment came a week before the grand opening. Just before the equipment was installed, we discovered it wasn’t licensed properly for the state of SC. When I called the company, they were very sorry to inform me they couldn’t get another machine in time. Fortunately for me, the company I hired to install the equipment was We All Scream™. We All Scream™ helped me when the other company couldn’t. They worked all weekend, finding a machine, cleaning it, and getting it installed in time for the health inspection. The machine passed inspection but several other things didn’t. We All Scream™ jumped in and helped. They built sneeze guards, installed automatic door closers, anything I needed to get the store ready for opening day. To me the most impressive thing about We All Scream™ is the quality of their work and the service after the sale. To this day the other company has never called. Tony calls once a month to ask me how things are going. He cares. To me that’s 90% of it. How did you hear of Lancaster Manufacturing? I researched Lancaster on the internet. Found Lancaster through search “frozen custard” when I was in the market for new/used frozen custard machines. I chose this manufacturer because I’ve heard through multiple sources that some other new frozen custard machines aren’t quite as good because they use an electronic control on their machines. Were you considering any other forms of training? No, I was not. I had been conversing with Tony for over two years before I decided to have him train me and my staff on the older Ross machines. How easy was it to arrange training? How flexible was the company? Was your schedule met? It was very easy to arrange for training and Lancaster Manufacturing was flexible too. My schedule was met. What were your top three objectives for the training? Were they met? Top three objectives were 1) learning to run & maintain the older Ross Frozen Custard Machines 2) How to make various custards & frozen desserts 3) find a refrigeration company in the area and all were met. Was the length of training suitable? How would you change it? Length of training was just fine, we scheduled two full days with Tony and it was enough to jog my memory & help out my other staff. I would not change it necessarily, as Tony was flexible in what we needed. How confident are you that Lancaster Manufacturing will support you in the future? Would you recommend Lancaster Manufacturing to a colleague? Why? I would definitely recommend Lancaster Manufacturing to anyone in the business because Tony was responsive, informative and you could tell he knew what he was doing pertaining to the mechanics of the older frozen custard machines and he knows his was around frozen desserts.